In the 1960s when Egypt decided to build the High Dam and called for the salvage operation of Nubian monuments, all temples were relocated to another, safer location except the monuments of Qasr Ibrim which was built on top of an 80-metre tall rock formation above the Nile's level, thus preventing its inundation by the flow of Lake Nasser after the completion of the dam. 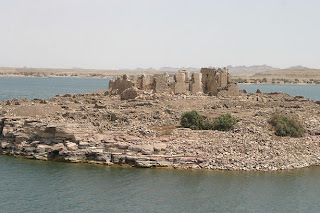 Such remarkable preservation on site has recently been threatened by the high water levels of Lake Nasser associated with construction in Toshka. Almost 60 per cent of the island has been inundated and water leaks into the temple most of the time. Water has also reached the foundation of the cathedral which has led to several cracks on its walls. Blocks of the podium located on the edge of the Nile have been dismantled which may lead to an eventual total collapse. The fortification walls have indeed collapsed, and mud-brick buildings near the new water line have fallen as well, either from the effect of direct water or from percolation. The most important of these are a 25th Dynasty temple, from which a wall painting has already collapsed and another is now in danger of disappearing. Percolation through dry deposits also threatens the excellent organic preservation of the site. Once exposed to water, the organic matter decays rapidly to a brown smelly slime from which nothing can be recovered. "The damages increase year after year which demands the intervention of UNESCO to rescue and protect the only vestige of Nubian monuments that still remain in situ," Mohamed El-Biali, head of Aswan and Nubian Monuments in the Supreme Council of Antiquities (SCA), told Al-Ahram Weekly. El-Biali said Egypt needs rapid and immediate action similar to that of the 1960s when UNESCO played a significant role in leading the international salvage campaign for Nubian monuments. 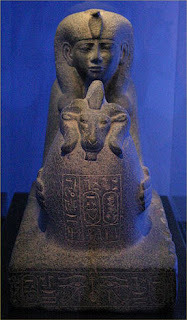 Egypt renewed its appeal to UNESCO in 2000 and 2005. 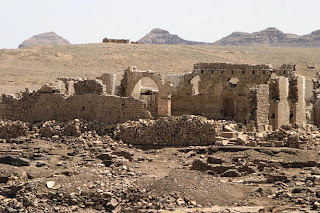 See the above page for the full story, which also offers a short description of the history of Qasr Ibrim. Beginning today (30th), Brazilian researchers will share their knowledge of the Ancient Egypt in the southern Brazilian city of Curitiba. Until Saturday (01st), the Campos de Andrade University Centre (Uniandrade) will receive Egyptologists and experts on the subject coming from different regions of Brazil. They will participate in the 2nd National Summit for Egyptology Studies. The theme will be religion in the daily life of the Ancient Egypt. According to the coordinator at the Summit, Moacir Elias Santos, around 150 people are expected to attend. Subjects to be approached will include, for instance, the way in which the pharaohs would associate their political propaganda with religion, the cult to animals that existed at that time, and the texts in the sarcophaguses, ancient tombs. The panels will also include themes that do not pertain to the main subject matter, such as the heritage of Egyptian obelisks in present days, elements of the Egyptian charges and caricatures in the Brazilian print media, and the presence of Ancient Egypt in children's and juvenile books. Hoping to boost Egypt’s tourism income, Egyptian Tourism Minister Zuhair Garranah has expressed concern about Taba and Nuweiba, two Sinai Peninsula tourist regions with a potentially high levels of tourism levels. The Egyptian Tourism Federation (ETF) said it has received permission from Minister Garrahah “full responsibility for compiling a full strategic market planning report in order to turn Taba and Nuweiba into economic or investment regions. The two regions are expected to boost the nation's tourism income. Once I was actually asked in all seriousness for my professional opinion on whether alien build the pyramids. The man said: ‘There’s so much discussion of the alien theory that there must be something to it, right?’. Well, my short answer would be, ‘No. There isn’t anything to it at all.’ My longer answer will follow, with a thorough dissection of the central arguments of the alien theory and why they are wrong. I think the main reason the theory is so popular is that people like to believe in things, things that are much bigger than themselves, whether it’s god or aliens. But often people also want proof and they seek to find it in the pyramids and other ancient monuments. It’s no wonder that the pyramids are incredible enough that they inspire people to believe the unbelievable. I myself don’t think there’s anything wrong with postulating that there might be other life out there in the universe, but I also don’t believe in robbing humanity of pride in its achievements. See the above page for the complete post. Any two lists of the top 10 archaeological discoveries in Egypt would be different in only one or two items. Atlantic Productions is making a film for the Discovery Channel based on just such a list, and asked me to be its host and introduce these finds to the public. I felt honoured that two of the discoveries included on the list were my own. It was my first time working with this fantastic team, and I really enjoyed it. They did their homework, and Ben, the director, was very quick and smart. We spent the entire first day of filming at Giza, beginning with an interview in front of the Great Pyramid. We looked at two discoveries on the plateau. The first was the boat of King Khufu which was found by Kamel El-Mallakh in May of 1954. It is a version of a story that Hawass has told elsewhere, with reference to a "curse" on the discovery of the barque. Qasr Ibrim (Per-Mit/Premis) is the only site above water level that actually remains in its original location. It was fomerly located on a tall headland, which now forms a small island (it takes quite a leap of the imagination to visualize the island as a headland). The site is currently being excavated by the Egypt Exploration Society. Located opposite the important ancient regional centre Aniba, it dates from the New Kingdom, if not earlier, and has a mud brick temple built by the Twenty Fifth Dynasty Nubian king Taharqa, which was later occupied by Christian worshipers in the Coptic period. Tourist boats are allowed to approach Qasr Ibrim, but it is not permitted to set foot on the island due to the fragility of the surviving ruins. When I first visited in March the water levels were very close to the main ruins, which implies that other material was already submerged. With the unprecedented recent Nile floods backing up behind the Aswan High Dam, it is no surprise that the archaeology is now under threat. 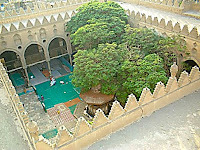 Here are some pictures of the site taken in March 2007 to accompany today's Al Ahram Weekly article on the subject. Here are the last three pictures that accompany yesterday's short report about the survey work taking place at Saqqara's Step Pyramid. Due to some problem with Blogger today (again), the images won't expand when you click on them. If you want to see the full sized images I have stored them on a holding page which you can reach by clicking here. Thanks to Bastiaan Lieffering for pointing out the problem. documented, with archaeological data suggesting that a major migration from tropical east Africa to the Levant took place between 130,000 and 100,000 years ago via the presently hyper-arid Saharan-Arabian desert. This migration was dependent on the occurrence of wetter climate in the region. Whereas there is good evidence that the southern and central Saharan-Arabian desert experienced increased monsoon precipitation during this period, no unequivocal evidence has been found for a corresponding rainfall increase in northern part of the migration corridor, including the Sinai-Negev land bridge between Africa and Asia. In Brussels, a government spokesman recognised that Belgian diplomats effectively drove in the classified site, without having left the road however, which rules out according to him, the possibility of destroying the whale fossil. Belgian diplomats immediately left the space as soon as they were informed that this was a protected site, the Belgian government spokesman explained. Short piece looking at the way in which similarities in art reflect similarties in ideas even over very long distances. National Geographic News reported last month that an international team of archaeologists had discovered the oldest known art in Egypt. The country is, of course, known for its pyramids and mummies, but the art in question is 10,000 years older than the dawn of Egyptian civilization. 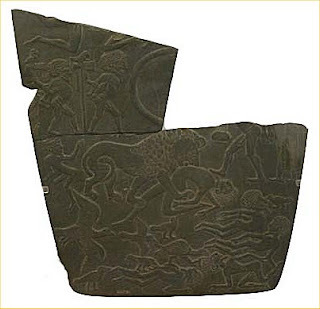 The art consists of petroglyphs, or engravings on stone, estimated to be 15,000 years old. Its style is closer to the art of Paleolithic France than to that of Pharonic Egypt. . . .
We share a common humanity, so our cultural expressions are bound to share some important elements -- regardless of where, or when, we live. Oman informed the Egyptian Foreign Ministry of its decision to withdraw its candidate from the UNESCO Secretary-General nomination in support of Egypt's candidate Culture Minister Farouk Hosni. "There are Egyptian and Arab efforts and consultations to agree on one candidate for this top post so as to increase the chances of Arabs to win the 2009 elections,"Farouk Hosni said in press statements on 28/8/2007. He praised the efforts of Foreign Minister Ahmed Abul-Gheit who has informed all embassies and foreign ministries of Egypt's choice. With the Omani candidate's withdrawal, the two Arab candidates remaining are Farouk Hosni and Moroccan ambassador in UNESCO Aziza Binani. Egyptologist or cultural anthropologist to further study the CT scans to help determine when they lived, which would determine how old they are. Artefacts from ancient Egypt will go on show at a special hands-on exhibition in Paisley Museum. . . . Items on show will include ornaments, sacred objects and household utensils from the National Museum of Scotland in Edinburgh as well as Paisley Museum’s own collection. before touring Renfrewshire communities in the New Year. Paisley is in Scotland. I failed to find any useful information about the exhibition - this seems to be the only reference to it. The Museums page on the Renfrewshire website merely shows opening times and the postal address, and the Paisley Museum site offers a brief description of some of its collections but no details of the exhibition. More details about the upcoming visit of the Tutankhamun exhibition to London, all very much as before, but there are a couple of photographs of artefacts from the exhibition and some details about the reign of the king and the background to the excavation of the tomb. There is a photograph from the last visit of Tutankhamun to London, when the famous mask was present (not in this exhibition), with the Queen looking at it wearing one of those completely blank expressions so characteristic of the time. Full details of the exhibition are at http://www.kingtut.org/. There's no need for a "Daily Photograph" today, because Dr Bruno Deslandes, Head of the Latvian Scientific Mission in Egypt, has sent me this wonderful update, with a set of maps and diagrams . I will be posting some of the photographs today and some tomorrow, with my very sincere thanks to Dr Deslandes for such a lovely surprise! All the very best to the Latvian team, and keep up the good work. Riga (Latvia) August 21, 2007: During its last campaign, the Latvian Scientific Mission, which has already worked more than two years in the Step Pyramid of Saqqara (Egypt) in the framework of its joint-venture with the Egyptian Supreme Council of Antiquities and direct supervision from Dr. Zahi Hawass, has successfully carried our some additional documentation works, very important for the safeguarding and restoration of the oldest stone monument in the world. Resources allocated to this program (15 scientists) represent the largest scientific team never mobilized abroad in the History of this small but scientifically highly advanced Baltic country. of the regular collapses happening in the pyramid. 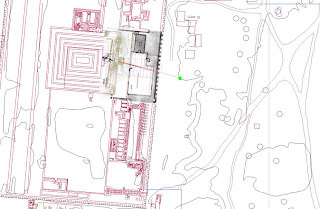 - In this context, The Latvian scientific team has realized jointly with SCA partners some Emergency shoring and consolidation works in the 5th and 6th galleries belonging to the so-called royal family galleries and located at the deepest level of the pyramid. These galleries present some very serious structural pathologies and imminent risks of collapsing. Therefore, restoration specialists knowledge and experience have efficiently contributed to protect 2 alabaster sarcophaguses by use of reversible new technologies, like for example polymer beams and nets. Based on this efficient solution, is currently discussed the best way to shore and consolidate the very unstable vault located on top of the central burial shaft. - Detailed Architectural and structural investigationscontinuation. Some risky detailed surveys completed by some Carbon 14 dating have significantly increased the understanding level of the constructive chronology of this monument dated back to 2660BC as well as through the next historical main interventions, like the Saite or Roman ones. - In order to accurately study the pyramid foundations shape, the surrounding original ground level relief and the stratified structure of the underground, has been carried out some Geophysical investigations (Ground Penetrating Radar). The obtained results have exceeded all expectations. First of all, very qualitative GPR signals have been collected up to –50m. It could be underlined that such quality of so deep signals has been obtained by Latvian produced equipment and software. These GPR investigations have also highlighted some underground cavities and galleries. 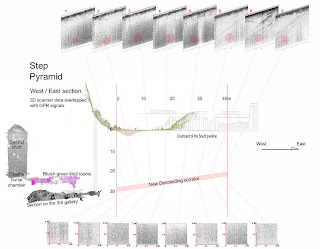 These new structural and geological data are very important for a proper understanding of exact structural condition of the pyramid, and will have to be seriously taken into consideration for its restoration. It can be noticed that, as part of underground non-geological cavities, appeared on the eastern façade a new descending corridor starting from the dry moat and reaching the 3rd gallery. GPR investigations have undoubtedly provided to Egyptologists an interesting and surprising fact which will require from them further studies. Click on the smaller image to look at the bigger versions which let you see the details. Egyptologist Bassam El Shammaa believes that the famed half-lion, half-man statue was an Egyptian deity that was erected next to another sphinx, which has since vanished without a trace. This contradicts what many have believed for centuries — that a single colossal statue functioned as a guard to the Pyramids. . . .
El Shammaa remarked: “My own interpretation is that the miracle structures were dedicated to the lion deities that also ensured their protection. The demolished temple in front of the Sphinx’s paws and the Valley Temple that stands next to the site of what we assume to be the second sphinx are proof that those two statues were deities. Some of the ideas on which Bassam El Shammaa bases these suggestions are clearly outlined on the above page. Richard Hodges has been named the Williams Director of the University of Pennsylvania Museum of Archaeology and Anthropology. Hodges will join Penn Oct. 1 from his position as director of the Institute of World Archaeology at the University of East Anglia in the United Kingdom. A world-leading classical and early medieval archaeologist specializing in western Europe, Hodges has been director of both The Prince of Wales' Institute of Architecture in London and The British School in Rome. For the past nine years, he has worked extensively on archaeological and cultural heritage projects in Albania including the creation of a large cultural heritage institute in Tirana and a new archaeological museum in Butrint. "This is a proud moment for the Penn Museum, for the University of Pennsylvania and, indeed, for anyone who treasures the art and culture of the world's civilizations," Penn President Amy Gutmann said. "Richard brings an unparalleled level of leadership experience and creativity to the University that will resonate beyond the faculty and the students and will continue to make the Penn Museum a source of knowledge and inspiration." See the above for full details. I posted a couple of photographs of the fabulous White Desert, which lies just to the north of Farafra Oasis in the Western Desert. A couple of people have emailed to ask me more about the formations shown in the photographs, so here's a short explanation. Although the White Desert is surrounded by limestone cliffs, the floor of the Farafra depression is white chalk (limestone) dating to the Cretaceous. The formations are the result of geological processes that have acted upon this white limestone, removing the somewhat powdery soft layers from the floor and leaving behind them these strange mushroom-shaped cores of rather more reslilient fabric. The mushroom shapes themselves are caused by sand, blown by the wind, which effectively blasts the surviving formations at a few metres above the ground level, creating the "waists" and stems visible in my photographs before eventually underminging the top of the structures completely. I hope that that helps! Coastal geoarchaeologist Jean-Daniel Stanley of the Smithsonian's Museum of Natural History said his team's work suggested a much larger community at Rhakotis than previously believed. The discoveries, reported in the August issue of GSA Today, the journal of the Geological Society of America, came by accident when his team drilled underwater in Alexandria's harbor, Stanley said. "This often happens in science. We were not searching for an ancient city," said Stanley, who has been working in the Nile Delta for 20 years. Their project, part of a 2007 Smithsonian-funded study of the subsiding Nile Delta, also involved Egypt's antiquities department and a French offshore group. Scientists extracted 3-inch-wide sticks of core sediment 18 feet long under the seabed to try to understand what happened to cause later structures from the Greek and Roman eras to be submerged. Drawn from Auckland Museums own collections this gallery illustrates part of the depth and variety of ancient civilisations and cultures from all over the world. A focus of this gallery is Ancient Egypt from the pre-dynastic period to the Roman and Christian (Coptic) eras, including the display of the Museums very own Mummy which will finally be given a permanent home. The gallery will also house significant collections from the great civilisations of the past notably Greece, Rome, Mesopotamia, India, China and Central and South America. Egypt Egyptian authorities have accused Belgian diplomats of damaging a 40 million-year-old whale fossil when they allegedly drove over the remains in a protected desert area, an official said Monday. Belgian officials denied any damage was done. Mohamed Ibrahim, an official in the Ministry of Environment, said the diplomats in four-wheel-drive vehicles ran over the fossil in July after ignoring signs warning visitors not to drive in the Wadi el-Hitan, or Valley of the Whales, protected area and UNESCO World Heritage site located about 93 miles outside of Cairo. The Belgian Foreign Ministry and its embassy in Cairo denied the vehicles caused any damage to the fossil. Foreign Ministry spokesman Marc Michielsen said the two diplomatic-plated all-terrain vehicles were in the area but "did not leave the road." "They were not aware that the area was a protected area," Michielsen said. "It seems the area was not cordoned off, and no notice or guards were present." Egyptian and Belgian authorities both said the incident took place in July. It was unclear why Egyptian officials waited until now to make the allegations. Also on the Egypt Daily Star website. Thanks to Paula Veiga for sending me this link to articles made availble online by Peter Brand. “A Grafitto of Amen-Re in Luxor Temple Restored by the High Priest Menkheperre,” in G. N. Knoppers and A. Hirsch, (eds. ), Egypt, Israel, and the Ancient Mediterranean World: Studies in Honor of Donald B. Redford, (Leiden, 2004), 157-266. Ideology and Politics of the Early Ramesside Kings (13th Century BC): A Historical Approach, Prozesse des Wandels in historischen Spannungsfeldrn Nordostafrikas/Westasiens: Akten zum 2. Symposium des SFB 295, Mainz, 15.10.-17.10.2001, (Würzburg, 2005), 23-38. “The ‘Lost’ Obelisks and Colossi of Seti I,” Journal of the American Research Center in Egypt,” Vol. 34 (1997), 101-114. "Secondary Restorations in the Post Amarna Period," Journal of the American Research Center in Egypt 36 (1999), 113-134. "The Shebyu-Collar in the New Kingdom Part I" Journal of the Society for the Study of Egyptian Antiquities 33 (2006), 17-28. "Veils Votives and Marginalia: The Use of Sacred Space at Karnak and Luxor," in P. F. Dorman & B. M. Bryan, (eds. ), Sacred Space and Sacred Function in Ancient Thebes, Occasional Proceedings of the Theban Workshop, SAOC 61 (Chicago, 2007), 51-83. W. J. Murnane & P. J. 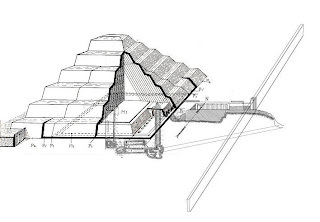 Brand, “The Karnak Hypostyle Hall Project (1992-2002), Annales du Service des Antiquités d’ Égypte 78 (2004), 79-127. There is one paper of interest in this book by Janneke de Jong: "Egyptian Papyri and 'Divinity' of the Roman Emperor" (p.239-252). Janneke de Jong surveys what we can learn from third-century papyri about the imperial cult in Egypt, concluding that "the Roman imperial cult in Egypt was acceptable for the Egyptians, because it made the Roman emperor visible in a visual programme that was understandable for them and in which they could participate actively" (p. 252). Both papers are useful, if not particularly revelatory. In Lukas de Blois, Peter Funke, Johannes Hahn, The Impact of Imperial Rome on Religions, Ritual and Religious Life in the Roman Empire: Proceedings of the Fifth Workshop of the International Network Impact of Empire (Roman Empire, 200 B.C.-A.D. 476) Münster, June 30-July 4, 2004. Leiden: Brill, 2006. Pp. xi, 287. See the above page for full details. Egypt received a record 9.7 million visitors in 2006-07, 13 per cent up on 8.6 million in the previous year, state news agency MENA said on Monday. Egypt's financial year runs from July to June. The visitors brought $8.2 billion to the country, 14 per cent up on $7.2 billion in the previous year, preserving the status of tourism as a major contributor to Egypt's current account, along with oil and gas exports, Suez Canal transit fees and remittances from Egyptians working abroad. Alexandria, the Egyptian coastal city where Cleopatra had love affairs with Julius Caesar and Mark Anthony, is trying to regain some of its old glory as a tourism destination for European and Arab elites. This summer, a new luxury hotel opened on the site of a grand old establishment where Austrian archdukes and Egyptian khedives would gather for Viennese pastries or tennis a century ago. Last year a multi-storey mall with brands such as Guess and LaSenza opened to the public, and the city is building a new international airport to meet demand from tourists. With Egypt's economy recording its third consecutive year of gross domestic product growth over 5 percent, an oil-fuelled boom in Gulf economies bringing more tourists, and European economies strong, the city is already enjoying some success. "Alexandria has been so neglected over the past decades but there is a still a lot of nostalgia for the way it used to be," said Stephan Killinger, manager of the new Four Seasons San Stefano hotel. The hotel, built overlooking the Mediterranean on the model of its famous predecessor, has been sold out since opening in July, Killinger said. See the above address for the rest of the three page story. The Temple of Ramesses III at Medinet Habu, West Bank, Luxor. European diplomats in four-wheel drive cars have caused millions of dollars worth of damage to a fossilised whale lying for millions of years in the Egyptian desert, a security source said on Sunday. "Whale Valley officials have informed the authorities that people from two diplomatic corps vehicles destroyed the fossil," the source told AFP after the destruction was discovered around 150 kilometres (95 miles) south of Cairo. Two cars drove into the protected area on Friday and then refused to stop when asked to do so by wardens who nevertheless got the vehicles' registration numbers which the source said were from "a European country." "The damage is more than 10 million dollars," the source said. The site, known as Wadi Hitan (Whale Valley), was home to whales around 40 million years ago when the area was ocean. It is a UNESCO World Heritage site and home to hundreds of of whale fossils. There is a photograph of one of the whale skeletons on the above page. At the symposium about northeast African archaeology in Poland in July, the subject of "adventure tourism" and the damage caused by irresponsible tourists to some of these important and beautiful areas which are not on the usual tourist routes was discussed frequently. Visitors who take souvenirs break up archaeolgical sites, removing the raw data from which entire communities and lifestyles can be resurrected on paper. Everyone welcomes responsible tourism, where visitors with a genuine interest are supervised by qualified personnel, but the question is how to filter out the idiots from the genuine articles. One of the suggestions was that fixed routes could be established through the desert areas, from which cars would not be permitted to deviate, and that only recognized guides should be allowed to accompany vistitors who would be limited fixed numbers. But it is difficult to see how or when this could or would be implemented. Very sad indeed. Serge Rosmorduc has just announced on the Ancient Egyptian Language list that the latest patch for JSesh is now available from the above website. Version 2.4.13 of JSesh has just been solves a critical bug in 2.4.12 (the "save" function did not work properly). So, if you have downloaded 2.4.12, you should download 2.4.13 instead. Notable features of these versions include better mac integration and improvements to the palette. Thank you for pre-registering for tickets to Tutankhamun and the Golden Age of the Pharaohs, London. This email is to remind you that you will have the opportunity to buy tickets for this once-in-a-lifetime event before the general public, ensuring ticket availability. You will receive a follow up email on 10 September telling you how to purchase your tickets. Once you receive the email, you will have approximately 48 hours to buy your tickets before they go on general sale. Due to overwhelming demand, it is strongly recommended that you purchase your tickets during this presale period. Tutankhamun and the Golden Age of the Pharaohs opens at The 02 on 15 November and runs until 30 August 2008. This spellbinding exhibition will feature over 130 Ancient Egyptian Treasures. The last time Tutankhamun's treasures visited the UK, over 1.6 million people attended, making the "Treasures of Tutankhamun" the most successful exhibition in UK history. Your window to pre-purchase exhibition tickets before the general public will expire on Tuesday, 11 September at 5 PM. I believe that certificates are still available. For more details see the Tutankhamun Exhibtion website above. The mudbrick pyramid of Hawara and the Labyrinth, Faiyum. The Sudan Human Rights Organization has asked for the immediate release of Nubian archaeologist Dr. Muhammad Jalal Hashim. SHRO-Cairo notes that General Gosh, director of the State Security Department, psychology professor Zubair, the Minister of Interior, and Attorney General Minister of Justice al-Mardi have not yet taken the required measures to end the abusive actions by their state offices that continue to prolong the unlawful detention and intimidation of Dr. Muhammad Jalal. Archaeologist Jalal is a human rights activist who has been critically voicing the deep irrevocable protest of the Kajbar (Kajabar) people in the Northern Province of Sudan against the government’s dam construction in the area that will inevitably destroy the national treasures and all sites of the ancient Nubia archaeology, as well as forcing a new Diaspora for the natives of the area; thus disrupting the social fabric of the whole population. The Organization is deeply concerned that the top officials of the government’s legal security organs abused their constitutional jobs to keep, against the Interim Constitution, Dr. Jalal in unrestricted unlawful custody. Led by these officials, the authorities aimed to silence Dr. Jalal’s significant contributions in the increasing public protest of Kajbar against the dam. While Culture Minister Farouk Hosni was nominated for the post of UNESCO director-general, writes Nevine El-Aref, two of his closest aides are arrested on charges of bribery. . . . This time the furore involves, rather, two of his aides: the head of the Nubian Antiquities Salvage Fund Hussein Ahmed Hussein; and Ayman Abdel-Moneim, who is both director-general of the Cultural Development Fund and general supervisor of the Historic Cairo Development Project. Both were arrested on charges of bribery: Hussein was caught red-handed with an LE10,000 bribe from a contractor vying for the Nubian Museum restoration project; Abdel-Moneim was accused of amassing possessions from contractors working in Ministry of Culture restoration projects. Early investigations have revealed that both defendants unlawfully received a range of gifts from luxuriously furnished apartments in Cairo's fashionable districts and plots of land to rugs and meals of fish. Together with three contractors involved in the case, they will be in detention for 15 days pending the results of further investigation. The allegation that expenses of contractors working on archaeological sites were being disbursed in return for bribes taken by some of the ministry's top officials were first made in 2006, when the Administrative Control Authority (ACA) started on the case. As a result of investigations made since, all five defendants may face trial at the formidable Supreme State Security Court. Shortly after serving as assistant to Abdel-Halim Noureddin during the latter's tenure as secretary-general of the Supreme Council of Antiquities (SCA), Abdel-Moneim became Hosni's Antiquities Department secretary, where he showed great talent for improving archaeological and historical sites, taking on development projects in the Abu Simbel and Kalabsha Temples and in the Manesterly Palace on the Cairo island of Roda; as Historic Cairo Development Project supervisor, he also oversaw the restoration of 200 Islamic monuments including mosques, sabil-kuttabs, mausoleums and wikalas. He also oversaw the restoration of the Mohamed Ali Palace in Shubra and the Sayed Darwish Theatre in Alexandria, and worked on the National Museum of Civilisation project. The case has put a temporary end to further progress on that front, but more importantly it will have major implications for Hosni's nomination by the Egyptian government for the post of UNESCO director-general in the 2009 elections in Paris. One of the articles is a fascinating look at First Dynasty burial traditions, including the sacrificial death and burial of retainers: Sacrifice for the State: First Dyansty Royal Funerals and the rites at Macramallah's Rectangle by Ellen F. Morris, Columbia University (pages 15-37). This volume represents a collection of contributions presented by the authors during the Second Annual University of Chicago Oriental Institute Seminar "Performing Death: Social Analyses of Funerary Traditions in the Ancient Near East and Mediterranean," held at the Oriental Institute, February 17-18, 2006. The principal aim of the two-day seminar was to interpret the social relevance resulting from the enactment of funerary rituals within the broad-reaching Mediterranean basin from prehistoric periods to the Roman age. Efforts were concentrated on creating a panel composed of scholars with diverse backgrounds -- anthropologists, historians, archaeologists, art historians, and philologists -- and the knowledge and expertise to enrich the discussion through the presentation of case-studies linked to both textual and archaeological evidences from the Mediterranean region. Fundamental to the successful realization of this research process was the active dialogue between scholars of different backgrounds. These communicative exchanges provided the opportunity to integrate different approaches and interpretations concerning the role played by the performance of ancient funerary rituals within a given society and, as a result, helped in defining a coherent outcome towards the interpretation of ancient communities' behaviors. Picture a map of Africa, and divide it in four. The top right-hand bit – the north-eastern quadrant, for the geographically minded – is dominated by the Nile. It has two main tributaries: the White Nile, flowing out from Lake Victoria in Uganda; and the Blue Nile, originating in Ethiopia. These two rivers flow into Sudan, meeting at Khartoum to form the Nile, which then continues north through the eastern edge of the Sahara and into Egypt, finally reaching the Mediterranean near Alexandria. The Nile's main features include some of the largest lakes in Africa. In Uganda, accompanying Lake Victoria is, inevitably, Lake Albert – as well as swampy Lake Kyoga. In Ethiopia, the Blue Nile flows out of Lake Tana, the Horn of Africa's largest body of water. Then there's Lake Nasser, backed up for 300 miles behind Egypt's gargantuan Aswan Dam, which creates one of the largest artificial lakes in the world. 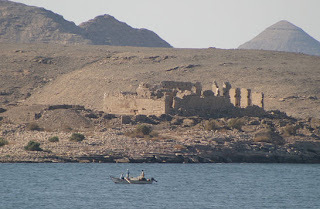 For overland travellers, a boat along Lake Nasser is the usual way between Sudan and Egypt. But unlike on some of the world's other major rivers, ultra-long ferry journeys down the Nile are not possible, due mainly to rocky rapids, or cataracts, cutting across the river. Had the Nile been navigable from the Mediterranean to its Blue and White tributaries in the deep interior, the map and the history of Africa might have been very different. Officials at the Putnam Museum in Davenport hope modern technology will upwrap the history of 2 mummies. The mummies underwent CT scans at a hospital yesterday. Radiologist Andrew Berkow says he probably won't be able to determine the exact ages when the mummies died but the remains could hold other information. For instance, were they children or adults when they died and did they suffered any diseases or malnutrition? One mummy is estimated at 2,000 years old. Berkow says it's a male. Scans of the other mummy didn't show any noticeable fractures, but indicated it was a young female. An exhibtion for children at the Taco Bell Discovery Science Center in Santa Ana, California (U.S.). Explore the more mysterious sides of science this Halloween when Discovery Science Center presents Spooky Science – Mummies! From Oct. 12 to Nov. 4, 2007, decode hieroglyphs, build your knowledge of pyramids and get the gruesome, gory facts behind the mummification process. Did you know that mummies are buried all around the world? In addition to Egypt, mummification was a popular burial method in South America. Explore the cultural differences between the processes of making a mummy in this special exhibition. The AIGYPTOS database was specifically created to enable the search for Egyptological publications by means of an elaborate subject indexing. It was developed at the Institute of Egyptology in Munich, Germany, and was available only locally for a number of years - therefore the language used for processing literature was German. An additional English version of AIGYPTOS is now available. Its specific aim is to allow queries using English keywords. Due to the limited time that was available for the creation of the English version, it has not been possible to translate the contents of all the searchfields into English, so that the entries in several fields, e.g. "place of publication", "language", "comment" et al. are still in German. Download and read back issues of Nekhen News, the Hierakonpolis Expedition's Newsletter, in PDF format - which is accessible by using Adobe Acrobat Reader (which is free to download). The earliest of these Nekhen News editions are truly archaeological documents in their own right, and you can read how the excavations at Hierakonpolis took shape, as well as see how we developed our 'Friends' organisation. mtDNA analysis of Nile River Valley populations: A genetic corridor or a barrier to migration? To assess the extent to which the Nile River Valley has been a corridor for human migrations between Egypt and sub-Saharan Africa, we analyzed mtDNA variation in 224 individuals from various locations along the river. Sequences of the first hypervariable segment (HV1) of the mtDNA control region and a polymorphic HpaI site at position 3592 allowed us to designate each mtDNA as being of "northern" or "southern" affiliation. Proportions of northern and southern mtDNA differed significantly between Egypt, Nubia, and the southern Sudan. At slowly evolving sites within HV1, northern-mtDNA diversity was highest in Egypt and lowest in the southern Sudan, and southern-mtDNA diversity was highest in the southern Sudan and lowest in Egypt, indicating that migrations had occurred bidirectionally along the Nile River Valley. Egypt and Nubia have low and similar amounts of divergence for both mtDNA types, which is consistent with historical evidence for long-term interactions between Egypt and Nubia. Spatial autocorrelation analysis demonstrates a smooth gradient of decreasing genetic similarity of mtDNA types as geographic distance between sampling localities increases, strongly suggesting gene flow along the Nile, with no evident barriers. We conclude that these migrations probably occurred within the past few hundred to few thousand years and that the migration from north to south was either earlier or lesser in the extent of gene flow than the migration from south to north. By M Krings, A E Salem, K Bauer, H Geisert, A K Malek, L Chaix, C Simon, D Welsby, A Di Rienzo, G Utermann, A Sajantila, S Pääbo, and M Stoneking. Am J Hum Genet. 1999 April; 64(4): 1166–1176. The full paper is available on the above site in PDF format. Marianne Luban has placed some of her work online at the above address, including her detailed speculation about the mummies in KV55, and her drawn reconstructions of the faces of pharaohs and other royal personages. There is also a page dedicated to Senenmut. 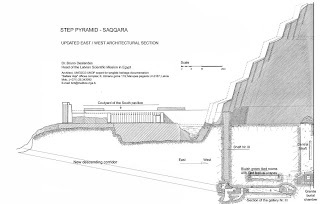 Moataz has updated his blog with a description of the pyramid of Pepi I, complete with diagrams and photographs. If you live in the UK or are visiting, this is quite a useful tool for finding some of the lesser known collections which house ancient Egyptian artefacts. Welcome to Cornucopia, an online database of information about more than 6,000 collections in the UK's museums, galleries, archives and libraries. Whether you are interested in painters or politicians, dinosaurs or space travel, the Romans or the Victorians, Cornucopia can tell you what is available and where to see it. A French team has discovered in western Egypt a graveyard dating back to the Ptolemaic era, antiquity officials said yesterday. 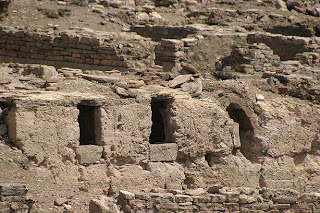 Most of the 25 tombs, found in the el-Kharga Oasis, New Valley Governorate, consist of a chamber 2 metres square and 1.45 metres high, they added. Six gold-painted mummies were also unearthed in good condition. Papyri, gold masks, funerary beds and bronze shaving implements were also found as well as statues of the four children of the god Horus. After a 35 year break, Tutankhamun is finally returning to London on 15th November for 9 months, with the initial week of the exhibition (15th November - 21st November) only open to O2 customers and their guests who will be the first to marvel at the ancient treasures housed in the cultural hub of The O2, The O2 bubble. In a further move to treat its customers like royalty, O2 has also arranged for its customers to be able to exclusively purchase tickets for The O2's Tutankhamun exhibition in a pre-sale period from 29th August-11th September, before the public sale commences on 12th September. Customers have to text TUT to 2020 to receive their unique password for that exclusive week. Hidden away among the vast collections of the Bodrum Castle and Marine Archaeological Museum are countless items recovered from sunken trading vessels that shed new light on the ancient world, among them a gold scarab thought to have belonged to Egyptian Queen Nefertiti. Director Yaşar Yıldız said the museum, which was founded in 1964, held 15,089 historical artifacts of which 1,432 are on display. The artifacts were recovered from sunken trading vessels discovered by local sponge divers and have been reassembled for display and occupy 14 rooms in St. Peter’s Castle in Bodrum. The Bodrum Castle and the Marine Archaeological Museum has countless items recovered from sunken trading vessels that shed new light on the ancient world, including the oldest logbook in the world. . . .
See the above page for the full story. Click here for the Bodrum Museum website. Biscuit-maker Jacob's is hoping for a place in the Singapore Book of Records, with the 'Largest Sculpture Made of Biscuits'. The feat sits on a platform measuring about 6 by 1.2metres, and more than 24,000 biscuits from 13 varieties are used. It includes the Eiffel Tower, the Great Pyramid of Giza, the Tower Bridge of London, the Great Wall of China, the Taj Mahal, Malaysia's Petronas Twin Towers and even Singapore's very own Esplanade. The tallest “building” – the Petronas – is over two metres high. There are two photos on the site. Slide show with explanatory captions of the new comic format versions of Agatha Christie's Hercule Poirot novels. The fifth slide shows Poirot in front of the Gizeh pyramids, from the novel Death on the Nile. Agatha Christie's crime novels, already immortalised on television, on film, on stage and in audio books, have been adapted as comic strip editions. The relaunch of Christie in this new way is timed to coincide with the annual Agatha Christie Week on September 9 to 15, 31 years after the novelist's death. For those of you with the following Symbian devices, the following game is now available - the Nokia E60, E70 and N80. Coming from the land of ancient Pharaonic civilization, a theme that takes you there. The Royal Family Worshipping the Aten sun Disk The mythology of the Aten, the radiant disk. Pictures from Kharga. No golden mummies, I'm afraid! University of Advancing Technology (UAT) instructor and senior web developer Joe McCormack has completed work on a web-based application that translates English words into cuneiform script from the Assyrian, Babylonian, Sumerian and the hieroglyphic script of Egyptian. The tool may be seen at his website, http://www.virtualsecrets.com/. The translator works by converting cuneiform and hieroglyphs, both used in the earliest forms of writing, into English words. For example, typing "I am a father" into the Ancient Egyptian translator yields hieroglyphs that roughly translate to "I am" and "father." The translator has been featured on several museum websites around the world and websites specializing in resources for the ancient world. "More than two thousand years ago an Indian sailor was found on one of the Red Sea coast; he was close to death and was taken to the authorities in Alexandria. Then the sailor made an offer if they let him go to his home country he would guide the Egyptians to a direct sea way to India shorter than any other. This represents the start of direct communications and trade exchange between Egypt and India." A new book, "India and Egypt…Influences and Interactions," traces the origins of historical links between Egypt and India to ancient times through a collection of research conducted by Egyptian and Indian scholars. The hundreds of images in the book help the reader see the differences as well as the similarities between the two cultures, revealing, for one, how far back Egyptian and Indian cultures have interacted in the field of art with paintings, sculptures and different motifs. Indian artifacts like pots or cosmetic cases were discovered in ancient Alexandria. Painted on these pots were pictures of Ancient Egyptian gods like Anobees. Another surprising discovery in India was a collection of small bronze statues of Ancient Egyptian god Horus in the ancient Indian city of Gandahar. See the above page for the full account. 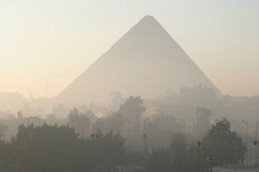 "Egypt will start its wintertime as of Friday, September 7," Cabinet Spokesman Magdi Radi announced Wednesday 22/8/2007. This means that Egyptians will set their clocks one hour backward. Egypt operates Daylight-Saving Time between the last Friday in April and the last Thursday in September when the clocks are a 3 hours ahead of Greenwich Mean Time (GMT). The date will change a little bit this year because of Ramadan, the Holy Muslims fasting month due to start Thursday, September 13. Hundreds of thousands of poor Coptic pilgrims and a handful of Muslims converged on the southern Egyptian village of Dronka on Wednesday where they believe the Holy Family stayed 2,000 years ago. . . .
Coptic texts, rejected as apocryphal by the Catholic Church, speak of a lengthy three-year odyssey by the Holy Family through Egypt, punctuated by miracles and other divine events. Dronka is near Assiut in Middle Egypt. A dusty crate of broken bits of pottery discovered at a stately home in Dorset has given a fresh insight into the life of the ancient Egyptians - and it turns out that concerns over mortgages, taxes and simply making ends meet were as important then as they are now. More than 200 "ostraka" - potsherds inscribed with notes - were found in the cellar of the National Trust property Kingston Lacy, near Wimborne Minster. Revealing the find yesterday, experts said some of the ostraka featured lists of temple priests who "stood before the god", but most were concerned with the minutiae of everyday life. Among the messages translated are receipts for a poll tax bill paid by a farmer, tax paid on handicrafts, income tax from a crop of dates and tax for the maintenance of public utilities. At least 16 of the tax receipts were issued to the same taxpayer, Patsibtis, son of Petorzmethis. He is also a taxpayer on more than 20 ostraka in the British Museum and other collections. The story is also covered in detail on the 24Hour Museum website, with photographs. 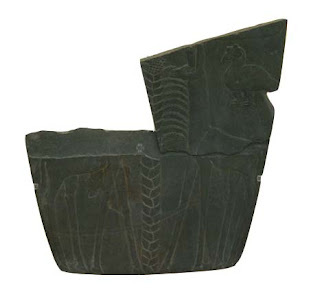 Numbering over two hundred pieces, Bankes’ collection of ostraka are believed to have originated from the island of Elephantine in Lower Egypt. They vary in date, and a number of different languages and ancient scripts appear on them. The majority are tax receipts dating from 200 AD, in Greek, an official language of Egypt at that time. The Delta was already in danger, threatened by the side effects of southern Egypt's Aswan Dam. Though the dam, completed in 1970, generates much-needed electricity and controls Nile River flooding, it also keeps nutrient sediment from replenishing the eroding Delta. Add climate change to the mix, and the Delta faces new uncertainties that could have a potentially more devastating effect on Egypt. Scientists generally predict that the Mediterranean, and the world's other seas, will rise between one foot and 3.3 feet by the end of the century, flooding coastal areas along the Delta.Already, the Mediterranean has been creeping upward about .08 inches annually for the last decade, flooding parts of Egypt's shoreline, el-Raey said. By 2100, the rising waters could wipe out the sandy beaches that attract thousands of tourists. Also at risk would be the buried treasures archaeologists are still uncovering in ancient Alexandria, once the second most important city in the Roman Empire. Stolen carvings returned to Egypt due to "curse"
I nearly relegated this to the Trivia slot, but I thought that the return of the antiquities was worth posting about, even if the reason for the return of the itmes was somewhat irritiating. A German man has returned several stolen pharaonic carvings to Egypt in the hope that his stepfather's soul can now rest in peace after he was reportedly struck down by the curse of the pharaohs. The man went to the Egyptian embassy in Berlin last week and handed over an envelope containing carvings his stepfather had taken from a tomb in Egypt's Valley of the Kings in 2004, the Supreme Council of Antiquities in Cairo said. The man said that on his stepfather's return, he was struck down by the legendary curse of the pharaohs - inexplicable fatigue, fever, paralysis and cancer followed by death. Also reported on CNN and Yahoo. Many thanks to Pierre Daoust, who has provided me with a set of his photographs to use on the blog. 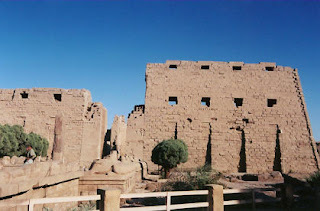 The following are all evocative shots of the temple complex at Karnak. All photographs are the copyright of Pierre Daoust, with my sincere thanks for his permission to use them. The Daily Star has a photograph today of American tourists looking at the mummified body of Ramesses II in its display cabinet at the Egyptian Museum in Cairo. A short video, preceded by an advert, showing the two Iowa mummies being prepared for the CT Scan, with musum and hospital staff shown talking about the mummies and the way in which information from the scans will be used to enhance exhibits in the future. They say nothing is certain but death and taxes – and the discovery of ancient shards of pottery covered in tax returns shows that even the ancient Egyptians could not escape. The pots, unearthed recently in a dusty crate at the Dorset mansion of William John Bankes, which he left to the National Trust in 1892, show that the everyday life of ancient peoples was not too different from ours. This is the complete story. A 3000-year-old Egyptian mummy is now on show as part of Perth Museum and Art Gallery’s new ‘Painted Ladies’ exhibition. The exhibition opened earlier than scheduled, and the delicate process of installing the mummy in the gallery was completed last week. Believed to be either an Egyptian princess or priestess, the mummy has been a feature of the museum’s collections since her arrival in 1935 from Alloa Museum. Perthshire residents will no doubt have their own memories of visiting the mummy when she was on permanent display in the museum. In an attempt to preserve her condition as much as possible, full exhibition of the mummy in the galleries has been limited in recent years. This latest exhibition means that a whole new generation of visitors can get to know one of Perth’s oldest residents. The Perth and Kinross Council website has details of the exhibition. 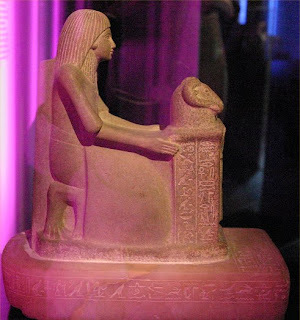 Photographs from the 2004/2005 exhibition Trésors d'Egypte - La cachette de Karnak which was held at the Musée Dauphinois in Grenoble, France. 22 of the statues from the remarkable Karnak Cachette were displayed in the former seventeenth century convent. The remarkable collection of statues was found in a courtyard of the Temple of Amun at Karnak. They date from the Old Kingdom through to the Ptolemaic period. Several hundred complete statues and fragments were found between 1903 and 1905 by George Legrain, and they represent the single largest collection of statues ever found in Egypt. Ground has been broken on the Government of Egypt’s US$550m (£271m, 400m euro) Grand Egyptian Museum (GEM) development near the renowned Pyramids of Giza. The 480,000sq m (5,200,000sq ft) site will focus on a 84,000sq m (904,000sq ft) museum building entered via an atrium containing a monumental statue of Ramses II and a grand staircase displaying huge statues of Egyptian Pharaohs. The third floor of the museum will feature the Permanent Galleries with views to the Pyramids, located 2.5km away. The centrepiece Gallery of Tutankhamen – approached via a suspended bridge entering the darkened tomb – will display 3,500 pieces belonging to the Young King Tut – the most comprehensive collection worldwide salvaged from the desecrated tomb. See the above page for more. 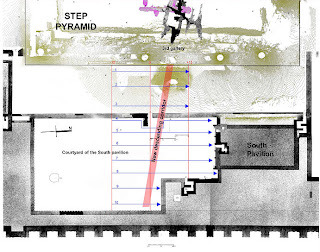 The page is accompanied by an picture of how the interior will probably look when the museum has been built, with Ramesses II in an atrium composed of slanting planes of stone and glass. After 15 years of hauling priceless relics from in and around its harbor, Alexandria municipal officials and Egyptian antiquity authorities are trying to figure out how to make thousands of artifacts still at the bottom accessible for viewing by the public. Municipal officials want to create an underwater archaeological park. Proposals under consideration include construction of an underwater bubble auditorium, conversion of the harbor into a giant pool with filters to remove silt and pollution and a submarine on rails to ferry visitors around. The goal is to push the city into the major league of antique tourist attractions, a club in Egypt long dominated by Cairo, Luxor, Aswan and Abu Simbel. Alexandria has a Roman amphitheater, a Greco-Roman museum, a combination Pharaonic- Greek-Roman National Museum and assorted columns scattered around town, yet it has never made the splash that, say, Luxor makes with its temples and tombs, much less Cairo, with the pyramids. This short piece adds the information that current estimates of the footprint's date are based on the age of the rock where the footprint was found, which had once been mud and that scientists are applying carbon tests to preserved plants found within the rock to determine its exact age. Khaled Saad, the director of prehistory at the council, said that based on , it could date back even further than the renowned 3-million year-old fossil Lucy, the partial skeleton of an ape-man, found in Ethiopia in 1974. 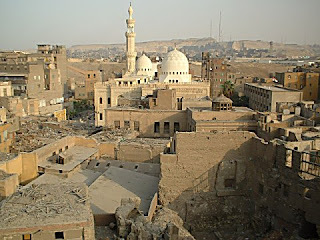 Minister of Culture Farouq Hosni said all restoration operations to save Historical Cairo districts are made according to the international technical and scientific standards laid down by UNESCO. "This huge project was launched in 1992 following the October earthquake that hit Egypt and caused big damage to the capital's antiquities and old sites," the Minister said. Hosni pointed out that the project has aimed at restoring rare and unique 517 archaeological sites on four phases. One family's 8 day trip to Egypt from Canada in 2007, described in a daily blog, by family member Kally. I lost count of how many times Kally uses the world "cool", but you do get a vivid sense of Egypt as experienced in someone else's head - for example, being somewhat underwhelmed by the pyramids at Giza, suffering information overload from a guide at Edfu, being unable to remember which tomb was which a day after visiting them, and waiting 10 minutes to cross the road to get to a MacDonalds. Kally doesn't say how old she is, but I wouldn't be suprised to find that this was a typical teenager's experience of a first whirlwind trip to Egypt. Donna and I opted to go inside the second pyramid for an additional 25 Egyptian pounds. We descended a cramped 1.2 m high passageway and arrived in the burial chamber without too much fuss. The chamber itself was a large, slightly renovated (concrete slab ceiling) room with the stone border in which the sarcophagus would have been placed. There wasn’t much to see and it was hot and humid, so we didn’t stay long. 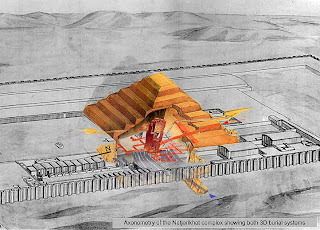 The main attraction of the second pyramid is, therefore, being able to say one has been inside a pyramid and not the actual experience of being inside of it. See the above page for the entire 8-day blog, with photographs. Egyptian Culture Minister Farouq Hosni said a stolen 4,500-year-old Egyptian relic that was to be included in a New York Christie's auction last year had come back home on Saturday, the official MENA news agency reported Sunday. See the above page for more, including a photograph of one of the vessels. The Putnam Museum is sending two of its mummies on a field trip in hopes of learning more about their history.The mummies, described as among the Davenport museum's most prized and popular possessions, will be carefully removed from their cases on Tuesday and taken by ambulance to Genesis Medical Center's West Central Park Avenue Campus, where they will undergo CT scans. The scans, being donated by the hospital, are expected to reveal new information about the mummies, such as their ages, genders and maybe even how they died . . . . The museum hopes to post new information about their history by November. More than 220 Egyptian artifacts from a collection that never before has left England will be on display at the New Mexico Museum of Art in Santa Fe from Sept. 1 through Jan. 6. "Excavating Egypt: Great Discoveries from the Petrie Museum of Egyptian Archaeology, University College" traces the development of Egyptian archaeology from its beginnings in the 1880s to the present. The collection originated with Sir William Flinders Petrie, an explorer and archaeological pioneer who developed the first scientific excavation techniques. The Oriental Institute Museum showcases 8,000 artifacts from some of the ancient empires - including those of Mesopotamia, Persia and Egypt - that gave birth to modern civilization. Some of the oldest cultural relics go back more than 5,000 years. Impressive stuff. Yet, the free Hyde Park attraction has only a relatively modest attendance of about 60,000 visitors each year. In fact, some refer to the 16,000-square-foot museum as the proverbial hidden jewel. "It drives us crazy when people call us that," says Gil Stein, director of the Oriental Institute that oversees the site. Stein said the museum doesn't have much of a marketing budget to compete with Chicago's major tourism draws. He added that the institute's mission is largely academic and driven by the continuing research of staff archaeologists. Still, officials at the museum are hoping for a higher public profile, with the conclusion of a $15 million renovation that was finished last year. The OI Museum has its own website, which has recently been updated and now has the same look and feel as the rest of the OI website, and has a page dedicated to the Egyptian Gallery (click on the thumbnail to see the full sized image). The page is divided into a number of sections, each of which looks at a different aspect of the four deities. The text is accompanied by many photographs. Click on the thumbnail to see the clear, sharp full sized image. The site is soon to be updated with other material, including the Nubian tombs of Pharaoh Tanutamun and his mother Qalhata. To see all that OsirisNet has to offer, see the Site Map. Another article about the recent discovery of ancient footprints in the areas of Siwa Oasis. A photograph accompanies this brief piece, but it is not very clear. The Supreme Council of Antiquities archeological mission operating in Siwa revealed the footprints of the prehistoric man, which likely dates back to 2 million years," SCA Secretary General Zahi Hawass said, noting that samples of the fossilized plants in rocks are being analyzed to identify their date. The mission is scheduled to complete its task within one month from now. "If it is proven that these footprints date one million years back, they will be the oldest archaeological site on earth, which shows that man in Egypt preceded in any other parts of the world," Hawass said, explaining that the footprints of the prehistoric man were etched on a layer of sandy mud that dried with the passage of time. Hawass noted that he has recently set up a department for the prehistoric monuments headed by Khalid Saad, which is currently working on recording archaeological sites dating back to prehistory. This is basically an advert for a forthcoming lecture by Dr. Robert S. Nelson entitled The Light of Icons at St. Catherine’s Monastery, Mt. Sinai, Egypt, to be held at the Cleveland Museum of Art. As lectures are so specific to a single place and time I rarely post about them, but the following introduction to the lecture, which looks at Coptic icons within the context of their original lighting, might be of interest. Professor Nelson is a leading authority on Byzantine art and architecture and the author of numerous publications. His latest work, Hagia Sophia, 1850-1950, asks how the famous cathedral of Constantinople came to be regarded as one of the great monuments of world architecture. He recently curated an important exhibition of Byzantine icons from the monastery of Saint Catherine on Mt. Sinai titled Holy Image, Hallowed Ground for the Paul J. Getty Museum in Los Angeles . The subject of the relationship between art and the light in which it was executed, or in which it was designed to be seen, is of interest in a number of fields including Pharaonic temples (for example the twice-yearly illuminated shrine at Abu Simbel and Franco-Cantabrian cave painting). The lecture will be held at 2 p.m. on Sunday, September 30 in Gallery 101 of the Museum. Under the auspices of Egypt’s Culture Minister Farouk Hosni, the secretary-general of the Supreme Council of Antiquities (SCA), Dr. Zahi Hawass, and the Aga Khan Trust for Culture’s (AKTC) general manager Mr. Luis Monreal signed today a memorandum of understanding finalizing the establishment of a temporary restoration lab at Salaheddin Citadel and a visitor center at the Urban Plaza at the northern end of the Al-Azhar Park close to the end of the 12th century Ayyubid Wall. The Urban Plaza project will be a mixed-use center with underground car parking, shops and cultural facilities, including a small museum essaying the history of Cairo since the ancient Egyptian era until the modern time through displays of great treasures and collection of artefacts that have never been on exhibit before.Hawass explained that these antiquities will be carefully selected from the Islamic and Coptic Museums in Cairo as well as the Salaheddin Citadel storehouses and Matariya archaeological sites. 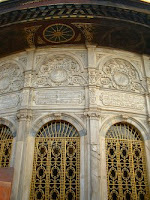 The museum will also give visitors insight into the urban, cultural and architectural history of the heart of Cairo. The laboratory will conserve and restore all the ancient pieces and artwork to be displayed in the museum, as well as those of the Museum of Islamic Art, due to open in 2007. Training courses for young technicians in this field will be provided.